Thanks to the strong support of voters for a bond issue in 2012, the Dayton Metro Library is undergoing a system-wide upgrade of its aging and outdated buildings. The new facilities will be reshaped for modern library needs to enhance programming and the patron experience. They will also enable the Library to operate more cost effectively, even with nearly triple the public space. When completed, Montgomery County will have 17 new community assets sure to be a destination for learning and gathering for people of all ages. Each Library will feature spaces tailored for children, teens, and adults with elements such as story-time corners, gaming, and quiet reading areas. The extensive service improvements include easy-to-browse collections and rooms of varying size for tutoring, small group work sessions, meetings, and community gatherings. The enhanced technology will include more computers, new devices, and upgraded power and connectivity. Most branches will offer more parking and the lower levels of the new Main Library will be converted to an attached garage. The projects are divided into segments based on severity of current building issues, status of property and land acquisition, and geographic spread. The goal is to have the final buildings completed in late 2017. To find out what's happening at your Branch, visit our Branch pages. In 1888, Ohioan Benjamin Harrison was elected President, Jack the Ripper was striking fear in London, Vincent Van Gogh cut off his ear and the Dayton Library opened its first permanent building, a gothic structure in Cooper Park. 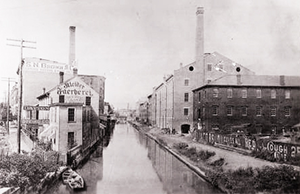 Just a block or two away, the Sachs-Pruden Ale Company constructed a sturdy new building on the canal at Fourth Street. In 2013, the Dayton Metro Library purchased this building to serve as its new Operations Center. 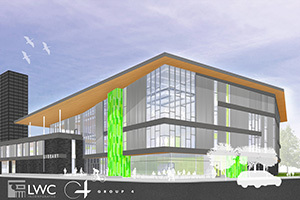 The purchase was part of the countywide facilities improvement project known as Libraries for a Smarter Future, made possible by voter support of a 2012 bond issue. Prior to the Library's purchase, the building was home to the Hauer Music Company, but its history dates back nearly 130 years. ReImagining Works is a partnership between the Dayton Metro Library and the Dayton Art Institute that will provide original artwork in each of the new facilities. At different points throughout the process there will be opportunities for both artists and art lovers to get involved...vote on pieces to provide inspiration...submit a proposal to create an artwork...or participate in a community art project. Find out more about what's currently happening with ReImagining Works here.